The opening ceremonies were held in Bislett Stadium on 15 February. King George VI of Great Britain had died on 6 February 1952 with his daughter Elizabeth II took the throne as queen, eight days before the start of the Games. As a result, all national flags were flown at half-mast, and Princess Ragnhild opened the Games in place of her grandfather, King Haakon VII, who was in London attending the funeral. This was the first time an Olympic Games had been declared open by a female official. The parade of nations was held according to tradition, with Greece first, the rest of the nations proceeding by Norwegian alphabetical order, with the host nation last. The British, Australian, Canadian and New Zealand teams all wore black arm bands at the opening ceremonies in memory of their monarch. After the parade of nations the Olympic flame was lit. On 13 February, at the start of the inaugural Winter Olympics torch relay, the torch was lit in the hearth of the Morgedal House, birthplace of skiing pioneer Sondre Norheim. The torch relay lasted two days and took place entirely on skis. At the opening ceremonies the final torch bearer, Eigil Nansen, received the Olympic torch and skied to a flight of stairs where he removed his skis, ascended, and ignited the flame. The nordic combined event was held at the cross-country and ski jump venues. For the first time, the ski jump part took place first with competitors taking three jumps from the Holmenkollbakken. The 18-km cross country skiing event took place the next day. Results were tallied by the best two marks were scored, along with the results of the cross-country race, to determine a winner. Norwegians Simon Slåttvik and Sverre Stenersen won the gold and bronze respectively. Stenersen went on to win the gold at the 1956 Games in the same event. Heikki Hasu from Finland won the silver, preventing a Norwegian sweep of the medals. There were three events in the Olympic figure skating competition: men's singles, women's singles and mixed pairs. The events were held at Bislett Stadium on a rink constructed inside the speed skating track. A majority of the ice hockey matches took place at Jordal Amfi, a new hockey stadium built for the Olympics. Nine teams played in the tournament and Canada again won the gold medal. Canada had won all but one Olympic hockey tournament thus far, but in 1956 the Soviet team began to compete and ended Canadian dominance. 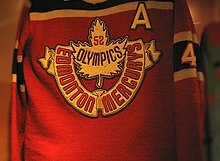 Canada was represented by the Edmonton Mercurys, an amateur hockey team sponsored by the owner of a Mercury automobile dealership. Canada played the United States to a three all tie on the final day to clinch the gold, and the Americans won silver. Norwegian newspaper Dagbladet criticized the result, calling the game "fixed in advance". The official report of the USOC for the 1952 Olympics covers the game from a different perspective. Accroding to the report, by the end of the game against Canada, the Americans were mentally and physically exhausted and after scoring the third goal and tying the game they decided to focus on defense in order not to lose silver. It is important to note that Canadians at the time were considered unbeatable and even tying that team was almost impossible. Sweden and Czechoslovakia ended up tied for third (Czechoslovakia defeated the Swedes in the head-to-head game, but according to the rules at the time they had to play a tiebreaker game because they were tied in points). Sweden won that game and avenged the loss in the round-robin. The Czechs believed they had already won the bronze when they defeated the Swedes in the round-robin, calling the decision to play a tie-breaking game a "plot of the capitalist countries". Canadian team was criticized for its rough play; although body checking was legal, it was not often used by European teams, and opponents and spectators alike took a dim view of that style of play. The IOC lobbied the organizing committee to host either military patrol or curling as a demonstration sport. The committee instead selected bandy, which had never been included in the Winter Games. Bandy, which is popular in nordic countries, is played by teams of eleven on an outdoor soccer field-sized ice rink, using a small ball and sticks about 1.2 m (3.9 ft) long. As it was a demonstration sport, the players were ineligible for medals. Three nations participated: Finland, Norway and Sweden. Each of the three teams won one game and lost one game; with Sweden winning the competition based on number of goals scored, followed by Norway in second place, and Finland in third place. Two of the games were played at Dæhlenenga Stadium and one at Bislett Stadium. The Oslo Winter Games were the first to feature an Olympic ice hockey tournament held on artificial ice. A new stadium was built for the hockey tournament in a residential area of eastern Oslo, called Jordal Amfi, which accommodated 10,000 spectators in stands rising steeply from the rink. 23 of the 36 hockey matches were played at Jordal Amfi, with the remaining matches played at Kadettangen, Dælenenga idrettspark, Lillestrøm Stadion and Marienlyst Stadion. The alpine skiing events were split between Norefjell and Rødkleiva. The slalom courses were at Rødkleiva, located on the same mountain as Holmenkollen and Frognerseteren. The course had an elevation difference, from start to finish, of 200 m (660 ft) and was 480 m (1,570 ft) in length. A rope tow had to be built to bring the skiers from the bottom to the top of the hill. 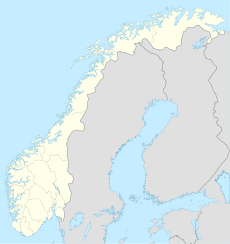 The downhill race and the giant slalom—which made its Olympic debut in 1952—were held at Norefjell, which was 113 km (70 mi) from Oslo and the only venue located away from the capital city. Work had to be done to make the area suitable for Olympic competition. A bridge across Lake Krøderen was built to help alleviate transportation congestion. A new hotel, two ski lifts, and a new road were also constructed. There was no permanent bobsleigh run in Norway. Instead the organizers built a temporary course out of snow and ice. This is often wrongly assumed to have been built at Korketrekkeren. From Frognerseteren a separate 1,508 m (4,948 ft) long, 13-turn course was designed and built. The bobsleigh run was first constructed and tested in 1951, then rebuilt for the Games in 1952. A car was used to return the bobsleighs to the start of the track. ^ a b c d e f g "Oslo 1952". International Olympic Committee. Retrieved 27 April 2011. ^ "St. Moritz, 1948". International Olympic Committee. Retrieved 26 August 2010. ^ a b Ringstad, J. (1995). "Telecommunications for the VI Olympic Winter Games, Oslo 1952" (PDF). Telektronikk. Telenor. 91 (1): 71–77. ISSN 0085-7130. Retrieved 9 January 2014. ^ a b c d e f "1952 Oslo Winter Games". Sports Reference LLC. Archived from the original on 29 August 2010. Retrieved 26 August 2010. ^ Tønnesson, Øyvind (21 August 2001). "With Fascism on the Doorstep: The Nobel Institution in Norway, 1940–1945". Nobelprize.org. Archived from the original on 23 June 2011. Retrieved 27 June 2011. ^ "1952: King George VI dies in his sleep". BBC. 6 February 1952. Archived from the original on 7 October 2010. Retrieved 26 August 2010. ^ a b c "Bobsleigh at the 1952 Oslo Winter Games". Sports Reference LLC. Retrieved 31 August 2010. ^ "Fritz Feierabend". International Olympic Committee. Retrieved 3 September 2010. ^ a b c d e "Speed Skating at the 1952 Oslo Winter Games". Sports Reference LLC. Retrieved 31 August 2010. ^ "Speed Skating History". National Speed Skating Museum. Retrieved 31 August 2010. ^ a b "Alpine Skiing at the 1952 Oslo Winter Games". Sports Reference LLC. Archived from the original on 18 September 2010. Retrieved 31 August 2010. ^ Wallechinsky, David (1984). The complete book of the Olympics. Viking Press. p. 604. ISBN 0-670-23403-6. ^ Connor, Floyd (2001). Olympic's Most Wanted: The Top 10 Book of the Olympics' Gold Medal Gaffes, Improbable Triumphs, and Other Oddities. Brassey's. p. 202. ISBN 978-1-57488-413-5. ^ Bainbridge, Jim (5 February 2002). "A Record Unlikely Ever to Be Broken". The Gazette. Archived from the original on 6 February 2002. Retrieved 9 January 2014. ^ "2002 Vermont Ski Museum Hall of Fame Induction". Vermont Ski and Snowboard Museum. Archived from the original on 15 March 2012. Retrieved 15 March 2012. ^ a b "Cross Country Skiing at the 1952 Oslo Winter Games". Sports Reference LLC. Retrieved 31 August 2010. ^ "Hallgeir Brenden". Sports Reference LLC. Retrieved 8 September 2010. ^ a b "Nordic Combined at the 1952 Oslo Winter Games". Sports Reference LLC. Retrieved 31 August 2010. ^ "Sverre Stenersen". Sports Reference LLC. Retrieved 31 August 2010. ^ "Ski Jumping at the 1952 Oslo Winter Games". Sports Reference LLC. Retrieved 31 August 2010. ^ a b "Figure Skating at the 1952 Oslo Winter Games". Sports Reference LLC. Archived from the original on 30 August 2010. Retrieved 31 August 2010. ^ "Figure Skating at the 1952 Oslo Winter Games-Men's Singles". Sports Reference LLC. Retrieved 31 August 2010. ^ "Oslo 1952-Overview". ESPN. Archived from the original on 31 July 2010. Retrieved 31 August 2010. ^ "Dr. Tenley E. Albright". National Library of Medicine. Retrieved 22 September 2011. ^ "Figure Skating at the 1952 Oslo Winter Games-Women's Singles". Sports Reference LLC. Retrieved 31 August 2010. ^ "Germany Figure Skating at the 1952 Oslo Winter Games". Sports Reference LLC. Retrieved 31 August 2010. ^ "United States Figure Skating at the 1952 Oslo Winter Games". Sports Reference LLC. Retrieved 31 August 2010. ^ "Hungary Figure Skating at the 1952 Oslo Winter Games". Sports Reference LLC. Retrieved 31 August 2010. ^ a b c "Ice Hockey at the 1952 Oslo Winter Games". Sport Reference LLC. Retrieved 31 August 2010. ^ a b "1952 – Winter Olympics VI (Oslo, Norway)". The Sports Network (TSN). Archived from the original on 4 June 2011. Retrieved 2 May 2011. ^ a b "Jeux Olympiques d'Oslo 1952". Passionhockey.com. Retrieved 27 May 2012. ^ "What is Bandy". American Bandy Association. Retrieved 9 January 2014. 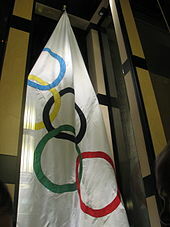 ^ "The Olympic Flag and Emblem". The Vancouver Organizing Committee for the 2010 Olympic and Paralympic Winter Games. Retrieved 2 September 2010. ^ "Bobsleighbanen". Markadatabasen. Oslo, Norway. 1952. Archived from the original on 2016-04-04. ^ "Bobsleighbanen fra OL i 1952". Markadatabasen. Archived from the original on 2015-07-21. ^ The emblem is the New Oslo City Hall overlaid by the Olympic rings, and surrounded by the phrase, "The 6th Olympic Winter Games / Oslo 1952". Espy, Richard (1981). The Politics of the Olympic Games. Berkeley, United States: University of California Press. ISBN 0-520-04395-2. Retrieved 25 July 2011. Findling, John E.; Pelle, Kimberly D. (1996). Historical Dictionary of the Modern Olympic Movement. Westport, United States: Greenwood Publishing Group. ISBN 0-313-28477-6. Retrieved 25 July 2011. Heinemann, Sue (1996). Timelines of American Women's History. New York, United States: The Berkeley Publishing Company. ISBN 0-399-51986-6. Retrieved 25 July 2011. Hill, Christopher R. (1992). Olympic Politics. Manchester, United Kingdom: Manchester University Press. ISBN 0-7190-3542-2. Retrieved 1 June 2011. Judd, Ron C. (2008). The Winter Olympics. Seattle, United States: The Mountaineers Books. ISBN 1-59485-063-1. Retrieved 1 June 2011. Klausen, Arne Martin (1999). Olympic Games and Performance and Public Event. New York, United States: Berghahn Books. ISBN 1-57181-706-9. Retrieved 25 July 2011. Organising Committee for the VI Winter Olympic Games (1952). Olympic Winter Games Oslo 1952 (PDF). Oslo, Norway. Archived from the original (PDF) on 4 June 2011. Retrieved 1 June 2011. "Oslo 1952". Olympic.org. International Olympic Committee. "Results and Medalists — 1952 Winter Olympics". Olympic.org. International Olympic Committee. This page was last edited on 12 January 2019, at 23:30 (UTC).